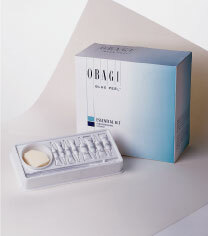 The Obagi Blue Peel uses Trichloracetic Acid (TCA) as the active ingredient mixed with the patented Blue Base from Obagi. Based on your individual needs and skin condition, the practitioner will determine the strength of the peel. Is Obagi Blue Peel a superficial, medium or deep peel? What skin problems does Obagi Blue Peel claim to treat? The Blue Peel significantly improves skin tightness and reduces fine lines, wrinkles, acne scars, large pores and hyperpigmentation. It works on all skin types and colours and is suitable for facial and non-facial skin. Obagi Blue Peel treatment should be performed by trained members of the medical profession only. It should not be used by beauty therapists. There is also a range of vitamin C based Obagi products including Obagi Professional C-Serum and Obagi-C Rx System, and one product used in conjunction with the Blue Peel is the Obagi Nu-derm System designed to enhance the effects of the peel and to sustain healthier, younger-looking skin. A skin conditioning programme using Obagi Protocols should be started at least 6 weeks before the Blue Peel is performed to ensure that the skin is in a healthy condition and to optimise the results of the Blue Peel. After the procedure, you will experience light erythema and your skin will peel within 2 to 3 days and will continue to peel for a few days. You should be healed in an average of 7 to 10 days. Again, this depends on area treated and how much is required, and the practitioner doing the treatment, but ranges are in the region of: £550 - £750+. Click for ALL Obagi Blue Peel clinics in the UK & Ireland registered and verified by Consulting Room.